As my first serious post, I've chosen one of my all-time favourites. This shot was taken at the famous Avenue of the Baobabs, north of Morondava in Madagascar, in July 2010. Erica and I were on a tour to the West of the country for a week and a half, and this was our last full day, on the road back from the Tsingy de Bemaraha. Our tour guide had timed things perfectly and we arrived during the golden hour. Just the right clouds were decorating the sky, the light was warm, and the usual crowds of tourists were in South Africa watching the Soccer World Cup. Everything just came together in this picture, a matter of being at the right place at the right time, and a lot of luck (I wasn't even paying attention to the guy on his bicycle). 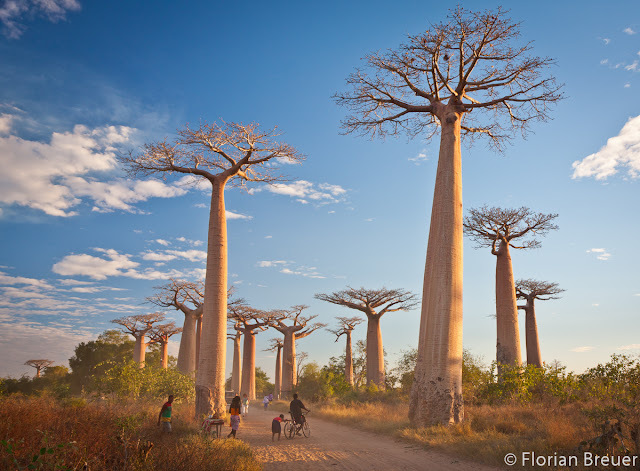 The trees are Adansonia grandidieri, one of six baobab species endemic to the island. The trees mostly line the road here, forming this avenue. Most probably, there were more baobabs here, but most of those further from the road had been cleared to make way for rice paddies (Madagascar's staple food). So this iconic scene of Madagascar is actually the result of the environmental destruction that is threatening the country. I shot this with my Canon 40D, EF-S 17-55mm f/2.8 lens at 1/60, f/5.6, ISO 100, with polariser and tripod. The aperture is actually too large, so the most distant trees are a bit soft. As for post-processing, this photo only really came into its own when I started using Lightroom. If you're quick (or, more likely, I'm slow with cleaning up my picassa albums), you'll find and older version of this picture in my picassa albums, which was processed with DPP (that's Canon's own raw converter, which came with the camera). What made the most difference, I think, is Lightroom's "fill light" slider, which is set to 40 here. I think it just looks better when the foreground is not too dark. Otherwise I made some minor adjustments to the usual vibrance and clarity, added a post-crop vignette, and slightly increased the saturation in the red and orange. But not as much as it looks: the trees really do have reddish bark, and this is accentuated by the light from the setting sun. This was one of my first photos to enjoy some success in competitions, and appeared in Getaway in November 2011, as well as Go Magazine and even National Geographic. I have to qualify this last bit: No, I did not win the National Geographic photo competition. I did win a prize in the Vale Eye on Sustainability Competition, which is hosted by NGM, and the winning photos appeared in the December 2011 issue of NGM - in an ad by Vale. Still, it felt pretty good, and my head swelled a few cm as a result. This is my first ever blog, and it's intended as an outlet for my photographs. I already have stuff on Picassa, but sometimes I just want to write a bit more about a given photo, or perhaps explain the makings of this or that shot, or just share my thoughts in general about a photographic topic.